BRISTOL SHOW 2011: Elipson Planet L lands in the UK | What Hi-Fi? Within the cabinet is a two-way, 16.5mm coaxial driver with a 25mm soft-dome tweeter. 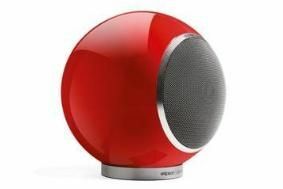 The speakers can be used for table, floor, wall and ceiling mounting and can be bought as a stereo pair for £599, or used to make up a multichannel system. Later this year, Elipson plans to develop active wireless audio systems. Also on the Elipson stand at Bristol is Parrot's Zikmu iPod dock system, designed by Philippe Starck, and AKG's latest headphone range, endorsed by Quincy Jones.